Chimeric antigen receptor (CAR) T-cell and bispecific antibody immunotherapies hold enormous potential for the treatment of cancer. But not all patients benefit from these therapies, especially those with solid tumor indications. An urgent need exists for novel detection strategies to better understand mechanistic function and efficacy at the single-cell level in a way that correlates to clinical outcomes. Population level studies do not provide the necessary insight into immune response heterogeneity at the single-cell level. IsoPlexis’ single-cell proteomics systems address this challenge by connecting each immune cell to the many cytokines they secrete, which orchestrate the immune system. This cellular response sensitivity is used to discover correlations to in vivo events in immunotherapy patients. Bispecific T-cell antibodies were engineered by the Sentman Laboratory for MICA and NKG2D: B2-OKT3 (MICA x CD3) and hNKG2D-OKT3 (NKG2D ligands x CD3). To test whether the engineered bispecific constructs could induce a potent antigen-specific T-cell response, single-cell PSI was computed for CD4+ and CD8+ T cells. The figure shows that hNKG2G-OKT3 induces more potent upregulation of polyfunctional strength index (PSI) than B2-OKT3 in both CD4+ and CD8+ T cells by the activation of K562 cells. Tz47-2C11 is the control. CD4+ and CD8+ cells show the same trend, with both profiles dominated by effector cytokines secretions. The IsoPlexis system identifies which cells are polyfunctional, i.e. those powerful cells that secrete multiple cytokines and quantitates the cytokine concentrations from each cell. The Polyfunctional Strength Index (PSI) multiplies the number of cytokines secreted per cell with the amount of each cytokine, to identify highly potent immunotherapies. PSI helps researchers better understand how T cells functionally respond to immunotherapies. It has provided biomarkers and mechanistic insights over the past year to improve the decision-making process for choosing CAR T-cell and bispecific antibody lead candidates. “The ability to easily perform single-cell proteomics provides a way to understand the complexity of the cellular response to immunotherapy and then to design and test new therapies to enhance efficacy,” said Charles Sentman, PhD, Director, Center for Synthetic Immunity, Professor, Geisel School of Medicine, Dartmouth College. Using the IsoPlexis single-cell proteomics system, researchers have identified cytokine-based biomarkers, which objectively evaluate the quality of antitumor activity of CAR T-cell response (pre-therapy) in a manner that correlates with outcome. Findings like this will enable more precise medicine and improve patient results. As bispecific antibodies, which bind to both T cells and tumor cells to help selectively kill cancer cells, share many similarities with CAR T-cell therapies in terms of tumor targeting (such as polyclonal T-cell activation, killing mechanisms, and cytokine-based toxicities), similar insight from the use of the IsoLight platform is expected in bispecifics as well. More than 90% of human tumors express ligands called natural killer group 2, member D (NKG2D) ligands (MICA, MICB, ULBP1-6), whereas very little is found in normal tissues. To explore whether targeting these antigens can enhance antitumor T-cell responses, bispecific T-cell antibodies were engineered by the Sentman Laboratory for MICA and NKG2D: B2-OKT3 (MICA x CD3) and hNKG2D-OKT3 (NKG2D ligands x CD3). To test whether the engineered bispecific constructs could induce a potent antigen-specific T-cell response, single-cell PSI across five functional cytokine groups, effector, stimulatory, regulatory, inflammatory, and chemoattractive, was investigated. 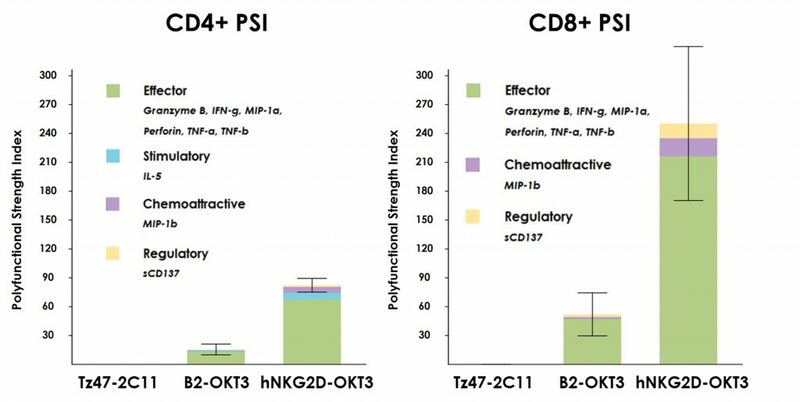 The results showed that hNKG2D-OKT3 bispecifics induced a more potent polyfunctional T-cell response than B2-OKT3 bispecific proteins from both CD4+ and CD8+ human T cells (see Figure). Both profiles were dominated by effector cytokines. CD4+ and CD8+ cells show the same trend and almost identical protein secretions. NKG2D can recognize multiple ligands, including MICA, MICB, and ULBP1-6, whereas B2 binds only MICA. The results suggest that bispecifics capable of binding to multiple tumor antigens may yield better therapeutic effect. Tz47-2C11 was the negative control protein. The IsoLight’s plug-and-play system includes a fully automated workflow and bioinformatics pipeline. Unique data visualizations, such as functional heat maps, polyfunctional activation topology principal component analysis (PAT PCA), and rank-ordered PSI bar graphs, are presented to explore and characterize single-cell polyfunctional profiles and reveal cellular insight across samples. IsoPlexis’ single-cell system improves insights into mechanism at the early stages of discovery by evaluating the quality of bispecific constructs and CAR T-cell products in a scientifically rational manner, offering a new approach for optimal lead selection.